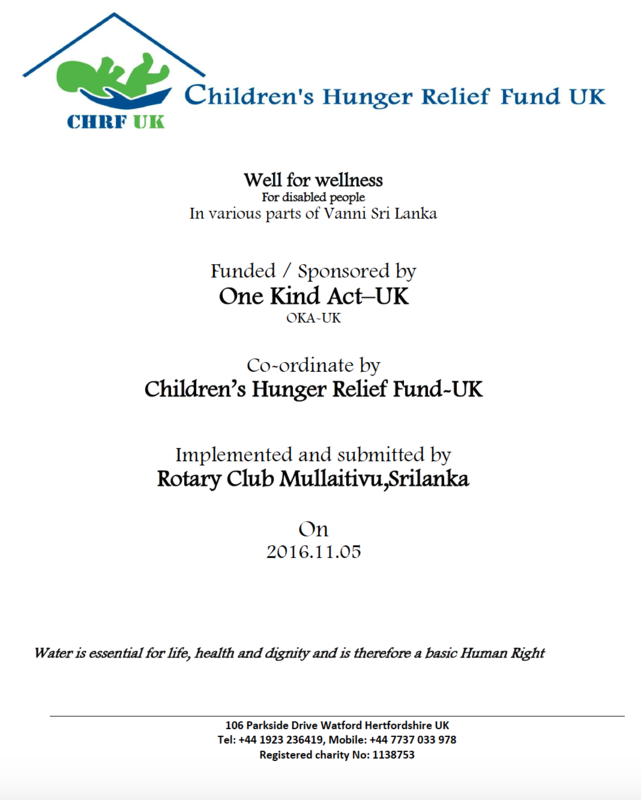 Childrens Hunger Relief Fund (CHRF) promotes the relief of hunger and improved sanitation facilities for the orphans and poor children in Northern and Eastern Sri Lanka. Amongst so many things in desperate need, it has also identified for better irrigated farming and wells to provide safe drinking water. 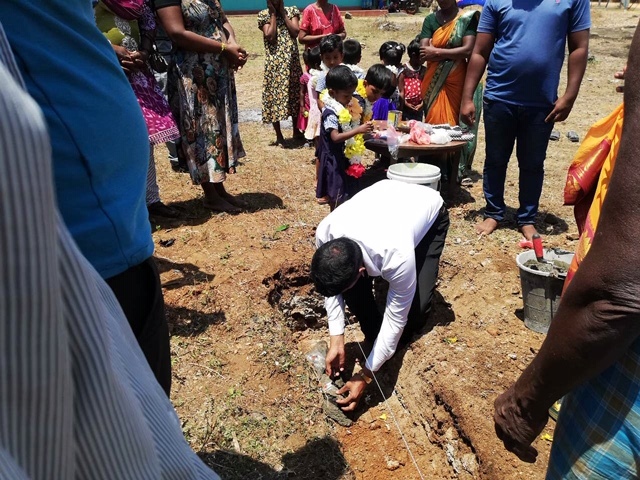 A grant of £10000 was made to carry out the construction and funding of a new pre-school for children as part of a new development for the poor. A grant of £5000 was made to build/repair wells. A grant of £5000 was made to build/repair 10 wells. The Sri Lankan civil war is well documented in the media. Although peace was restored in 2009, the legacy of 30 years’ war has been devastation and destruction that is still acutely suffered by those who survived. A ten square mile area in the Northern Province witnessed some of the most shocking horrors. Tens of thousands were killed and many more tortured and maimed. There was large scale destruction of homes, hospitals, water and sanitary facilities among other buildings. Livelihoods like fishing, farming, trading were shattered. Families were held in camps for months before being sent back to their village to rebuild their lives. Over time, the large foreign charities left, leaving behind thousands of bewildered, lost and despairing victims. Children's Hunger Relief Fund UK (CHRF) has provided the hope and lifeline so desperately needed. Since 2010 they have sent everything - from clothing, blankets, milk powder, food, to sewing machines and bicycles. Their vision is to restore self-sufficiency in the long term....to give a hand up rather than simply a hand out. Some examples of this initiative are setting up a sewing centre for widows, giving boats and nets to fishermen, seeds and water pumps to farmers, building wells. In the past few years their work has brought excellent results enabling displaced families to find their feet again. CHRF is now focussing on the high proportion of disabled in the area. Land mines, torture and indiscriminate bombings have left large numbers with loss of limbs, paraplegic or quadriplegic. As a start, crutches, commodes, beds have been provided. However they are looking to the long term future. Having identified most disabled are farmers, they are being encouraged to earn a living through farming, poultry, cows and goat rearing. A huge impediment has been the lack of water facilities close by. It is impossible for a disabled person in a wheelchair or artificial limbs to travel for hours to the nearest well to fetch sufficient water for even small scale cultivation. CHRF has identified those families in dire need of nearby wells and has undertaken to build them. The hope is that even the disabled will live a self-sufficient life in dignity. OKA is proud to support their noble work and has donated towards building several wells for the disabled. Water, which is a very basic need for human existence is denied to many disabled people. Most of the amputees are farmers, and farming is one of the options or only option to earn a living, in addition to poultry, raring cows and goats. Without water they can't do any of these. It is a common practice with the farmers to grow popular crops (short term crops/long term crops) in their own land, feed the family and also sell the excess and earn an income. This opportunity is denied to many disabled people due to the lack of water. They have to walk far, difficult to walk far with the artificial limbs to fetch water for their daily use and drinking. They can only bring water in small pots. There aren't any ways of getting water for sanitation and for the toilets. The houses are far apart and hence it is not possible to construct common wells. Tube well is another option. But these cannot do cultivation. They need water for drinking, cooking and for their cultivation. Out of the 50 people that we visited, about 24 people needed wells. There are more people asking for wells, but we didn't assess them yet. If we can provide them with wells, they can use water for drinking, their daily use and will be able to do cultivation, rare cows and goats and earn an income. Wells, though expensive, are long term investment for these farmers and can be used for many generations. There are about 200 children whose parents are paralysed and about 200 children whose parents are amputees from the list given to us. Without water, these children will be starving and go thirsty and can get many illnesses including kidney problems. The disabled people and their children encounter lot of difficulties during their day to day life. Travelling is the main hurdle as they live in rural areas, access is difficult, no public transport. They all will benefit from 3 wheel motor bikes and bicycles. But the priority at the moment is the water If we can give them a well at any cost, most of them will survive. They will at least be able to feed their children and fulfil the other basic needs. The cost to construct a well is about £1000.00, depending on the depth, width and the texture of the soil. The cost will go up or down depending on beneficiaries’ contributions and whether it is given to a contractor or not. Our field officers monitor the site and get the work done. Old wells can be refurbished at a cost of £500.00. Amongst the disabled people, we will be choosing only the keen, enthusiastic and knowledgeable farmers/disabled people for the construction of the wells. This is to limit the number of request due to limited funding. Wells could be constructed only in summer. During my visit to Srilanka in March 2016, I was pleased to see the farmers doing various short-term/long term cultivation and earning income. We bought lots of various vegetables and made them happy. They were ever so grateful to us for constructing the wells. We hope to see the same progress with the disabled people. 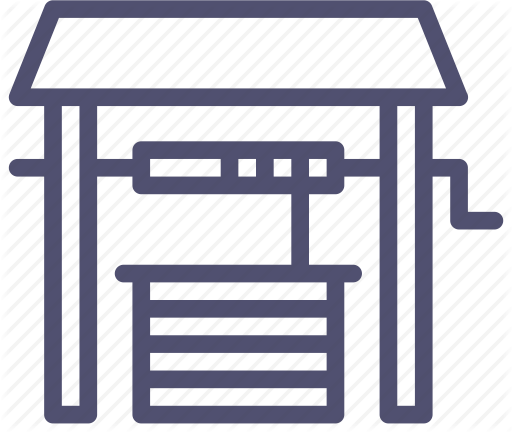 Enclosing herewith 2 reports regarding the well project. One is a detailed account with photos taken during contruction,stage by stage and accounts. We visited most of the beneficiaries before and during construction. 2nd one with photos of completed wells and the beneficiaries detail. Really sorry for the delay in sending this report. It was beyond our control. Since construction of a well involves various factors , we just could not finish the work earlier than this. Still construction is going on with other wells but disturbed by intermittent rain. Hope to finish them all soon. At the beginning (2012), we constructed the associated facilities such as water trough to store water, hard floor to stand and draw water or to have bath and a pulley system to draw water. It costed a fortune, about £1000.00- £1500.00 per well. Since there are so many thousands in need of well/ water, now, we are excavating as far as reaching the water level, constructing parapet walls for protection of the well from ruining and rubbish falling into the wells during flooding, and people accidentally falling into the wells and plastering inside and outside for protection. Below is a such completed well. We expect the beneficiaries to do these associate facilities as and when they can afford. By doing this , we are able to construct wells for many people. We appreciate if you could give us a feedback, positive or negative about this project. On behalf of CHRF-UK, we extend our sincere thanks to all the members of OKA. 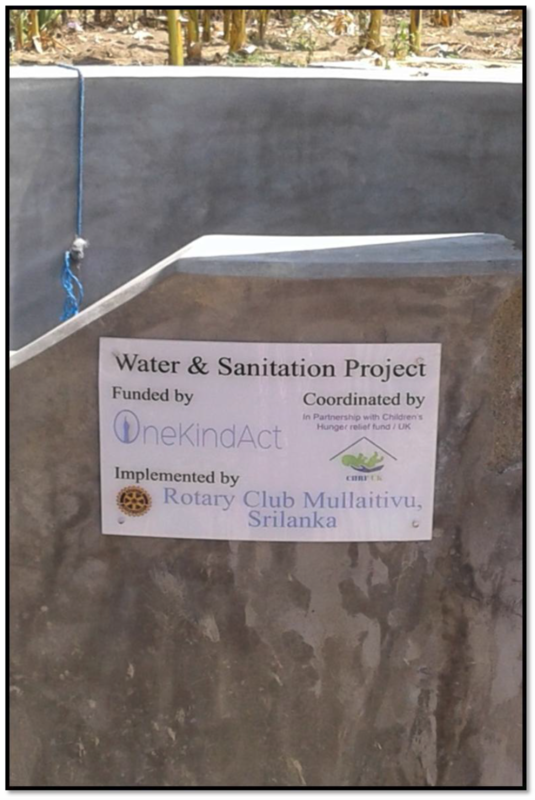 The £5000 donated by OKA was used to build 10 wells for the disabled in Vanni, Sri Lanka. Some examples are given below. As we can see all the beneficiaries have lost a limb or are paralysed due to the devastating legacy of land mines. Arulmathy is a widow, below knee amputee, with 3 children. She earns about £50.00 per month from tailoring. She has completed the well with the money given by OKA-UK. She is planning to do cultivation in addition to using the water for drinking and other daily use. Rasaratnam is a below knee amputee, with wife and 2 children. He has completed the well with the money given by OKA-UK. Wife earns £50.00 from tailoring. He has already started cultivation. They say, they will be able to enhance their income if they have livestock poultry etc. Subramanium is paralysed below waist, wheel chair bound; depend on his wife for total care. He has 4 children, all married and living elsewhere. Wife has been taking him out to (other people’s house) give his personal care and shower. Their well is successfully constructed with the money donated by OKA. There are 10 families like this who have been given a hand up towards a self sufficient, dignified life. CHRF would like to sincerely thank OKA for the successful completion of the wells which has brought real improvement in the quality of life and happiness for these unfortunate victims.